Your hammock stand will come with instructions for assembly. You may also refer to this instruction sheet when hanging the standard Tri-Beam Hammock Stand, our most popular stand. For instructions for the assembly of other hammock stands, please refer to the individual item. Place one of the poles between the two foot brackets, and slide pole over each foot bracket. 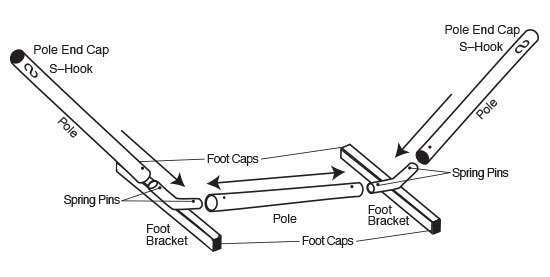 Foot brackets should be placed in the proper direction so they will sit flat on the ground rather than on edge. Place the other two poles at either end with the holes at the top facing each other and slide the poles over the foot brackets. Place the square end caps on the feet and the round end caps on the poles. Insert the "S" hooks in the poles and hang the hammock using the chain provided. Stretch the hammock as tight as possible before getting into the hammock and making adjustments. Be sure that your hammock stand is on level ground so that the weight can be evenly distributed to prevent any possible injury caused by a tipping stand when weight is not distributed evenly across the hammock and stand. We recommend assembling the stand near the area where your stand will rest. This will prevent having to move or drag the stand after assembly.